Not only is the store unrecognizable except for the sign above the door, but there is also nothing salvagable in the remains of the beautiful boutique. Montreal boutique owner Colin Seymour says : "It took 150 firefighters almost 12 hours to put out the blaze. […] the entire spring/summer collection, is practically irreplaceable. 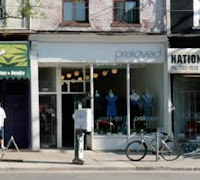 Despite this, Julia [Grieve, Founder and CEO] has remained incredibly positive, and swears that preloved will rise from the ashes, in a bigger, better location." Another store owner, Abraham Shalehchi of Abraham's Antiques also was burned down. Abraham is a frequent visitor to our booth at the Aberfoyle Antique Market and has bought from us since we first started in the business. Our hearts go out to Abraham in this time of need --an antiques store is full of irreplaceable items --stock that can never be fully replaced or valued. We hope Abraham is able to rally from this: he has unique tastes and is a rarity among people in the business: honest and personable. There are numerous groups and charities springing up to help the victims of the fire, including this Facebook group.